Teachers facing the challenge of meeting the diverse reading needs of students will find the structure and tools they need in Jan Richardson’s powerful approach to Guided Reading. Richardson has identified the essential components of an effective guided reading lesson: targeted assessments, data analysis that pinpoints specific strategies students need, and the use of Guided Writing to support the reading process. Hear what teachers and administrators have to say about Next Step. When I started as principal of North Elementary in April 2014, it became evident very quickly that our students were not reading well, and there was little evidence that literacy block instruction was effective with our K-3 students. I did not have a reading background, but I knew enough to know that students could be “caught up” by double dosing individually and in small groups. In my search for answers, two kindergarten teachers told me about Jan Richardson’s Next Steps. 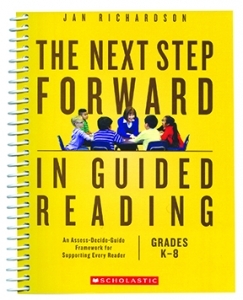 I got the book, and what they said was true: You could call this book “Guided Reading for Dummies!” I could understand it! Clearly laid out, simple explanations, excellent examples and forms, and the web site with the online lesson plan and other resources. North’s end-of-the-year proficiency, even with a student population of 96% free and reduced lunch, is the highest it has ever been. My colleagues and I were frustrated with the traditional scripted “pull-out” approach for reading intervention, which is not aligned with classroom instruction. We wanted to accelerate student achievement by collaborating and aligning reading intervention instruction with the classroom instruction. The greatest obstacle was finding the time needed for the classroom teachers to plan with the reading specialist. Using Jan Richardson’s Next Step in Guided Reading lesson plans and assessment tools provided a common language between the classroom teachers and the interventionist, which minimized the planning time and accelerated student achievement substantially. We experienced gains that were far greater than ever before. 90% of second grade students who participated in the aligned Guided Reading programs benchmarked at M or higher. The student who did not benchmark on-grade level (M) benchmarked at level L. Next Step provided assessment-based instruction that bridged the gap between the classroom and intervention instruction with minimal planning time needed. Everything you want and need to implement a comprehensive literacy program is in this book. Jan Richardson has taken theory, research, and practicality and woven them together in a guide that will enhance your teaching. As the literacy leader at my school, I asked teachers to join me in implementing the elements in The Next Step in Guided Reading from assessment to lesson plans to literacy centers. The results have been amazing. Guided Reading instruction is no longer a puzzle. Reading workshop is purposeful, organized, and enriching for teachers and students. Teachers are thrilled with the clarity and pragmatic shifts in their practice. This book is a resource must have for any teacher of reading.